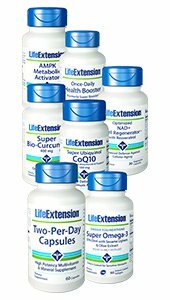 Advanced Health Essentials Kit: Our Advanced Health Essentials Kit has a 30-day supply of every supplement as our Core kits, plus Once-Daily Health Booster for hard-to-get fat-soluble vitamins, NAD+ and resveratrol for cellular energy support and longevity, and AMPK to help target unwanted belly fat. Optimized NAD+ Cell Regenerator™ with Resveratrol combines unique nutrients for longevity and youthful cellular energy production. NIAGEN® nicotinamide riboside, trans-resveratrol, quercetin, fisetin, trans-pterostilbene, and more support healthy cellular metabolism, fight age-related fatigue, regulates genes that control aging, and more. Once-Daily Health Booster provides optimized potencies of fat-soluble vitamins, carotenoids, and other nutrients needed by maturing individuals. AMPK Metabolic Activator has two powerful ingredients that safely trigger AMPK, which causes your body to start burning unwanted fat — particularly around your abdomen. Two-Per-Day Capsules have the highest nutritional potencies of any science-based multivitamin formula that can fit inside two capsules or tablets. With relatively high amounts of folic acid, vitamin D3, zinc, lycopene, lutein, chromium, selenium, and B-complex vitamins, Two-Per-Day Capsules can stand up to any multivitamin supplement on the market. Super Ubiquinol CoQ10 with Enhanced Mitochondrial Support™ works to re-energize every cell in your body. It provides the highly bioavailable ubiquinol form of CoQ10 plus a compound called shilajit. Researchers have found that shilajit boosts CoQ10’s beneficial effects by stabilizing the ubiquinol form of CoQ10 to prolong its action at the cellular level … and by facilitating more efficient delivery of CoQ10 into the mitochondria for greater cellular energy output. Sesame lignans, which help guard against lipid peroxidation, extend the stability of DHA in your body, and support a healthy inflammatory response. AMPK NOTE: This supplement should be taken in conjunction with a healthy diet and regular exercise program. Individual results are not guaranteed and results may vary.